If ever there was an advertisement for transhumanism wrapped into a slick science fiction thriller, Ghost In The Shell is it. I have never seen a film filled with so many "enhanced" individuals in my life. I do not think the word cyborg is used once in the film, but Scarlett Johansson's character of the Major is literally a human brain piloting an advanced android body. The term ghost is used as a metaphor for consciousness and or the soul of the individual. Major has been experiencing some glitches in the year from which she was told she was rescued from an accident aboard a refugee ship that claimed the lives of her parents. Now working as an operative for a branch of the law enforcement within the government that also is connected to the company that saved her life, Major and a group of operatives track down cyber terrorists with what appears to be a shoot first and ask questions later sort of attitude. I guess life is cheap in the future, but hardware is expensive because even a dead "enhanced" human being could be mined for information, which is the only currency left in a world where to be completely human is almost unheard of and a person like the Major is seen as the first of what could be the next generation of what humanity will evolve into. The implications of such a world, despite whatever public relations the transhumanist agenda might follow, are not at all something I think anyone would truly be comfortable in since people are literally inhabited through their cerebral enhancements by a remote operator that in addition to hacking into one's personality wirelessly, can also erase the memories of the individual and implant new ones. There are a lot of unexplored implications mentioned here and there that not only serve the plot and mystery, but gives an idea that this is a very different world than the one we have now and it is not necessarily because of the existence of technologically enhanced humans and artificial intelligence, but rather the people who create, serve, and support the conflicting agendas imposed upon them in the technocracy. Scarlett Johansson fills in the role of the Major quite well despite the fact in the original animated feature film this live action adaptation is based on, Major's character is Japanese. Michael Pitt is also very strong in his role and he has consistently grown in his character roles that have transcend his perceived range. I think he is a very underrated actor and hope he gets more feature film and television recognition because he is clearly very talented. "Beat" Takeshi Kitano is simply awesome as the head of the division Major is a part of and he brings a lot of presence and virtually chews the scenery in every scene he is in. Mr. Kitano is no stranger to genre films, having appeared in Johnny Mnemonic and Battle Royale films. He is also a comedic actor and there is one scene that made me laugh out loud that he is in. I wish I could articulate it here, but I think spoilers withstanding, it is better let the viewer discover it for themselves, specially since humor is extremely relative. WETA Workshop's effects are spot on top shelf and while I am not a fan of transhumanism and think some of the implications regarding the determination of what is indeed the soul and whether or not the nature of consciousness can be labeled as such a thing or is it a set of imprints that all things transcend after experiencing life in this world remains to be seen. Could a ghost in the shell be ultimately a prison or a delusion are questions people write about in various forms of fictio, drama and non fiction because it is all just speculation for now. 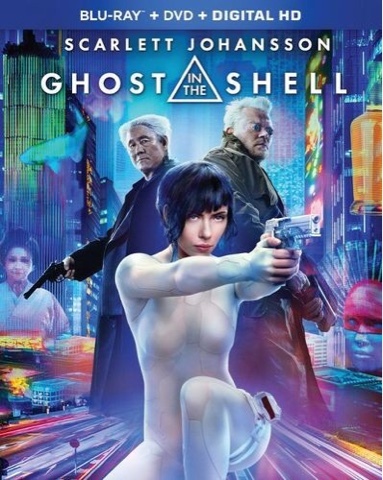 Paramount Home Entertainment's Blu-ray Disc edition presents Ghost In The Shell in a stunning 1080p full HD widescreen presentation with an enveloping English Dolby ATMOS Soundtrack that has to be heard to truly appreciate in the best home theater audio setup a consumer has access too. A descriptive audio track for the visually impaired is also included for both the Blu-ray and DVD versions of the film that is included here as well. While the DVD features an English Dolby Digital 5.1 Surround Soundtrack while both the Blu-ray and DVD feature French, Spanish Language Dolby Digital 5.1 Soundtracks. A Portuguese Dolby Digital 5.1 Surround Soundtrack is also included on the Blu-ray. English Subtitles for e Deaf and Hearing Impaired and French, Spanish and Portuguese Language Subtitles are encoded on to both discs though the DVD also included English Closed Captions too. The standard definition version on the DVD is enhanced for 16 by 9 televisions. Also included within the Blu-ray BD case is a limited time only redeemable code for either an iTunes or Ultraviolet Digital Copy of the film too. The extra value features on the Blu-ray Disc include a making of documentary (30:05), a look at the cast of characters brought to life in the film through the ensemble cast (11:29) and the philosophy of Ghost In The Machine (10:36). Ghost In The Machine will debut on Blu-ray Disc and DVD combo pack along with sold separately alternative Blu-ray 3D, 4K Ultra HD Blu-ray and single disc DVD editions on Tuesday, July 25, 2016 at retailers on and offline courtesy of Paramount Home Entertainment.